So what exactly is the Wacom Inkling? Many in our space are familiar with the Adapx pen which allows for capturing forms and other simple data inputs from special paper. 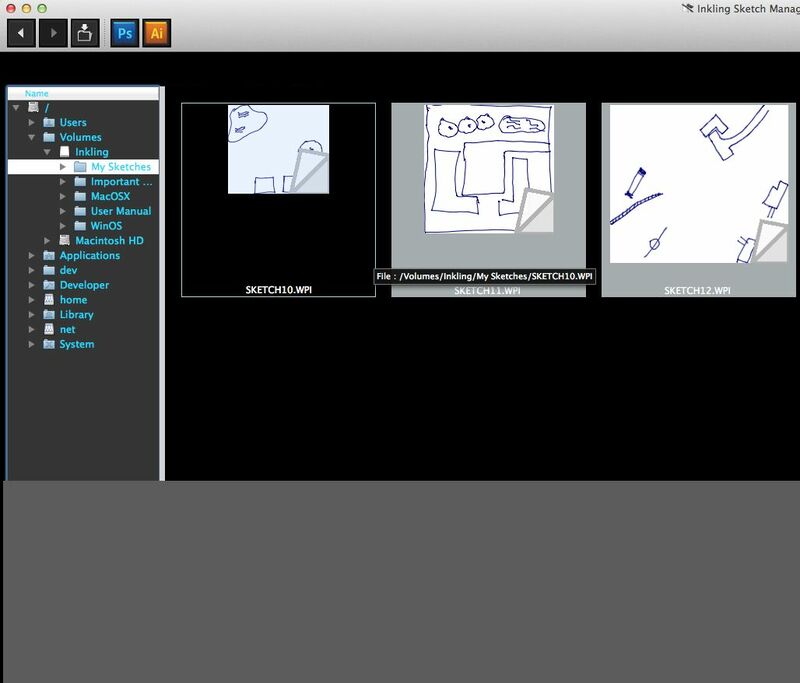 The Inkling is sort of the right brain answer to the left brain Adapx. So what exactly does the Inkling do and why would I pay $199 for it? Simply put, Wacom designed the Inkling to be a digitizer that works on any piece of paper. That’s a huge difference from the Adapx pen which requires their special paper with dots on it. 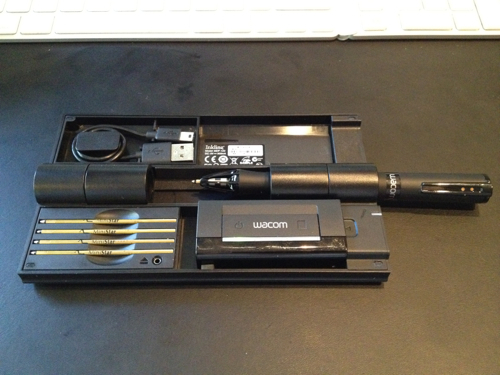 This means the Wacom pen can be used like an “ordinary” pen. Draw what you want and there it is. This is great for designers, but it means that the Adapx pen and the Wacom Inkling are after two different markets. There is no OCR or other recognition software, it just captures what you write as lines (heck, these are vectors baby!). The Wacom Inkling has a very nice travel case that contains everything you need to use the pen. So what do you get with the Inkling?The case that the Inkling comes in does a great job of holding all the pieces together and charges the pen and receiver when plugged into a USB port using the included cable. The pen itself is a tad thinker than I’m used to which means that id doesn’t always feel quite right in my hand. But for GeoDesign type applications, it is probably going to work out fine (think of writing with a sharpie size pen). It takes regular ink refills which is great in that it isn’t going to cost you, but the thickness of the ink was greater than I’m normally used to. I suppose you could get different refills, but I didn’t test that out. The Inkling Receiver clips on to any piece of paper. The Inkling Receiver clips on to your paper and uses some sort of infrared connectivity to figure out where the pen is. You can see the infrared beam area at the bottom of the receiver in the picture above. Yes, this means that if you put your hand in front of that beam, the pen becomes lost. It quickly rediscovers it, but you’ll want to keep that in mind while drawing. The other important fact about the receiver is that it only works on paper 8.5x11 inches or smaller. That means you can’t clip it on to some huge ANSI E plot and start working, you have to make smaller plots to work with. You clip the receiver to the top of the paper and start writing. As you can see in the picture above, you clip the?receiver on the paper and just start working with it. The green light blinks as you draw showing that it is getting data from the pen. There are two buttons on the receiver, the left one is a power button, but the right one is much more interesting. It is a layer button. You can start drawing, click that button and then work on a new layer. These layers are compatible with Illustrator and Photoshop (more later). Once you are done drawing, you unclip the receiver and plug it into a mini USB cable. The one included with the unit was short, so I used a longer cable that I had in a drawer. 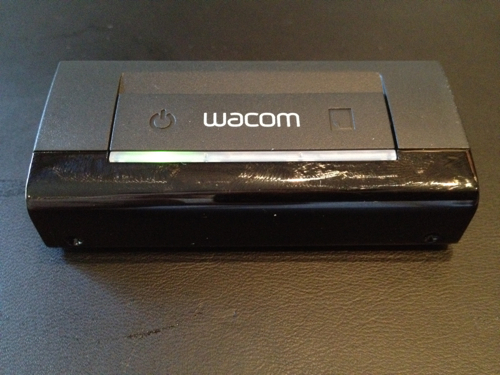 This shows up as a USB flash device and includes software that Wacom includes to download and convert the drawings. The Sketch Manager could be the weakest link to the package. 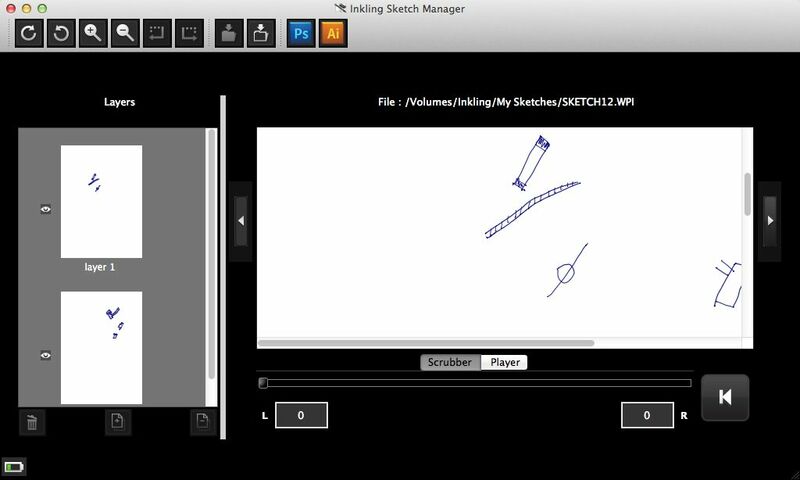 The Sketch Manager is used to transfer the sketches off the receiver and into formats that you can use. Unlike the well hardware, the software feels like a bad Windows 95 application. It is confusing and menus options seem randomly tossed around where you least expect it. The sketch manager recognizes Adobe Illustrator and Photoshop and puts some export buttons at the top to make it easy to get sketches in to those applications. The problem with this is that you need Adobe installed to export to AI. You can’t save as these formats, it does some sort of OLE thing where the vectors just show up in the application. You can see the layers in this sketch. But don’t be too sad about true EPS/AI support missing. It does support SVG export (as well as PDF and the regular raster exports such as jpg/tiff) which means you can get those vectors out and into applications that use it. I was able to export out the sketch into SVG and then upload it to my personal WeoGeo Library where I could then work with it how ever I needed it. 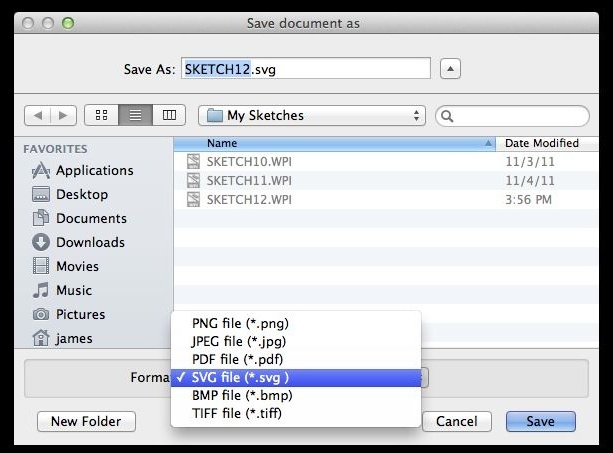 The SVG was able to be imported to Illustrator, ArcGIS Desktop and other applications that support SVG without issue. This means that you can make edits with your pen on paper and then bring those back into your digital tools for fine tuning. I’m no artist, but I have spent many times in the past 20 years marking up output from GIS systems using a pen on paper. From this perspective, I think the Wacom Inkling shines. 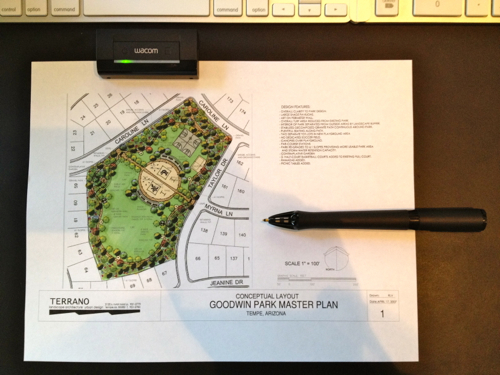 Designers and planners love to sketch by hand and then expect others to convert that to digital maps. I can see putting and Inkling in all their hands so that I can just grab the SVG output and bring it into my software. There are limitations of course, you can’t use anything bigger than 8.5x11 inch paper, the pen is a tad large, the ink is not fine enough; but I was able to start working with the pen immediately and produce great results without any problems. The price of the pen is reasonable considering other options (including digitizer tablets) and since it takes ordinary ink refills, future costs should stay low. I come from a design/planning background and I can’t tell you how much I would have loved to have a pen like this years ago. I’ve handed it to architects and planners and had them produce output that went right into projects with minimal editing. That really puts a smile on your face and produces great work that normally would have had to be digitized on-screen. I can totally see Wacom produce a line of Inkling products like they have with their Bamboo line. But for now, if you ever mark up maps or other documents and wish to get those lines into Adobe Illustrator or Esri ArcGIS, the Inkling is clearly the way to go.